Beep! Beep! 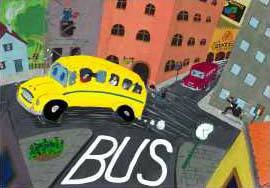 Bus is a game about the development of public transport in a city that is expanding quickly. The citizens are busy traveling up and down between their houses, the office and, most importantly: the pub. Your task as a player will be to develop a bus line that takes as many passengers as possible to the place they want to be. You do this by expanding your bus line, by developing new suburbs, by luring new potential passengers to the city and by investing in more and more buses. But you can also try to ride just a bit earlier than other companies and steal their passengers away.